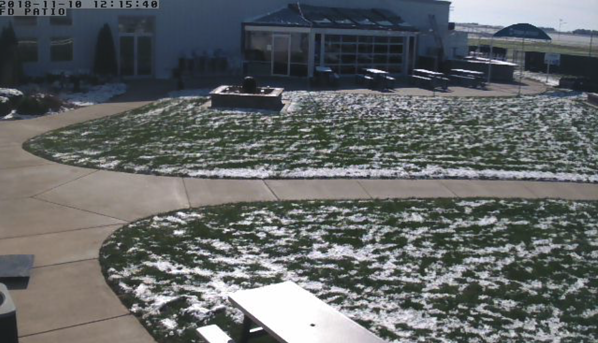 Winter appears to be starting early here in the Midwest with snow already on the ground. Just think, only 6 more months of this! The CSC and Flight Deck teams are busy getting ready for banquet season. It's not an easy task to make this place ready for corporate events, weddings, and holiday parties. It takes a lot of work to winterize the facility, remove all of the skydiving equipment, packing floors, and retail items and put up countless decorations including 5 Christmas trees. 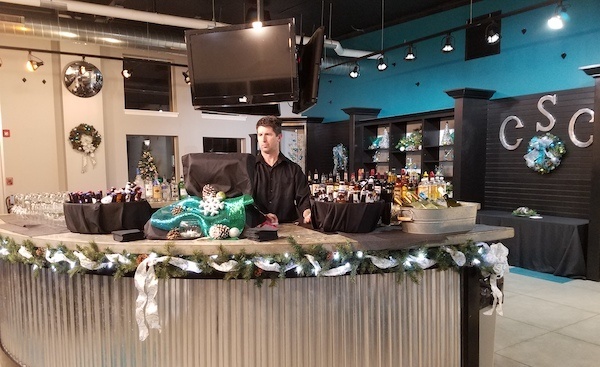 Manifest becomes a bar, the video room becomes a server station, the Freefall U room becomes a coat check, and the Pro Shop becomes an entertainment space. A shout out to facilities team who helps make this happen each spring and fall. To learn more about hosting an event at CSC, contact us. We are busy working on our 2019 events calendar and I'm really excited about it. Last season, the US National Skydiving Championships was our primary focus and many of our other events took a backseat. Next year, we're bringing many amazing events back and then some. We plan to have a lot of camps, comps, ratings courses, canopy courses, organizers, mentors, and parties. During the off-season, we're planning some fun stuff too. Stay tuned for more details on the CSC Holiday Party, bar crawl, ski trip, etc. The 2019 Pro Pass applications are live through December 15, 2018. We have several different iterations of the all-you-can-jump pass including the 30 Day Summer Camp Pro Pass and the new Team Pro Pass. Final selections will be made and announced no later than December 20, 2018. CSC has financing options available to help you save during the off-season. With our auto-pay feature, you can customize the amount of money and the frequency it's withdrawn from your checking/savings account. Think about this: if you opted to auto-pay $100 every two weeks, you would start the 2019 season with $1000 on your jump account (that's exciting and depressing all at the same time). It's safe and secure to sign-up for CSC Auto-Pay. And the best part is no credit card processing fees. Another option is to use our financing partner Blispay. Just fill out the online application and you'll have an answer in less than 60 seconds. It's a great way to finance $199 - $10,000 to pay for things such as Pro Pass, jump packages, gear, etc. It's that time of year to cast your vote for the Blue Skies Magazine Dropzone Awards. We'd be honored to earn your vote again this season. It takes just a few minutes and it's something we've been proud to be a part of for many years. It means a lot to us to always see our name mentioned along side the best dropzones in the world. A little secret: you can vote as many times as you want! As we approach that time of year when many of you travel south to get in some winter jumping, we urge you to be cautious. When you factor in a new environment, a bit uncurrent, different aircraft, different safety culture, and possibly even different equipment, that is a recipe for potential problems. Take some time to familiarize yourself on the safety guidelines, landing hazards, and outs at the new dropzone. Don't be afraid to ask questions and always start with a small group (or possibly even a solo) for your first jump. We also encourage you to increase your normal deployment altitude a bit to give you some more time under canopy to get familiar. If you're jumping at a busy boogie, be sure to ask if it's OK to deploy high before doing so. High pulls in a multi-aircraft environment can create safety issues. You can contact us anytime and ask for advice on where to go and what sort of safety concerns to consider. We're getting close to gift giving season. If you could share our gift certificate page with friends/family and on social media, it would help us get the word out about CSC and keep that winter revenue coming in. We are going to start leaning on email a bit more to pass information along to you. Based on feedback from many of you, we're using Facebook and Instagram too much and ignoring the people who are not on social media. While we'll continue to post on social media, we will also be sending emails to summarize what's going on at CSC. Speaking of social media, are you on the CSC Experienced Jumper Facebook page? If not, click here to request access. I'd like to take this time to wish everyone a safe and happy Thanksgiving. I owe each and every one of you a debt of gratitude for continuing to support CSC, the Flight Deck Bar & Grill, Sky Team Aviation, Inc. and all of the people who directly and indirectly rely on these companies to make a living.